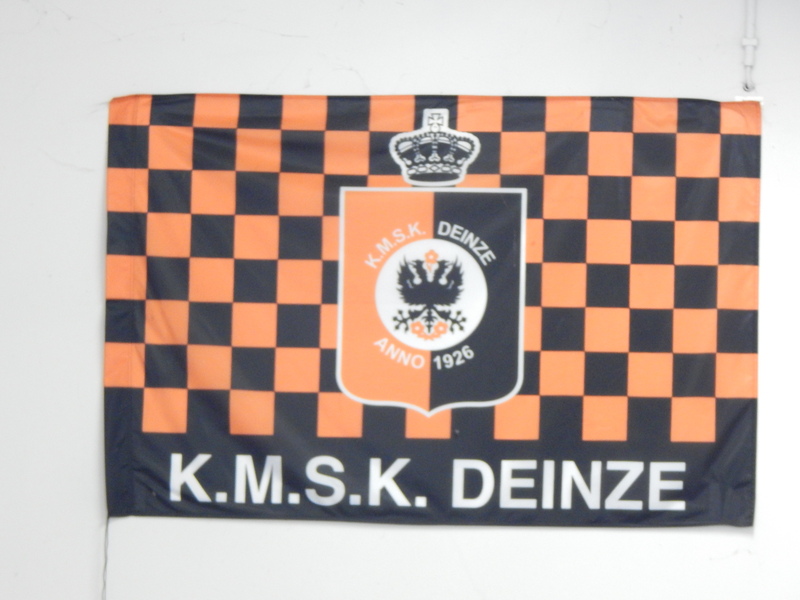 Football in the East Flanders town of Deinze (pronounced Dynzer) was served in the early twentieth century by Donza Football Club Deynze and then after the First World War by Sporting Deynze which were born out of the ashes of the old Donza club. By 1921 Sporting Deynze had folded and the town were left without a football club. In a meeting at the Café du Sport on March 12th 1926, Albert Van de Sompel chaired a meeting to form a new club to represent the town. 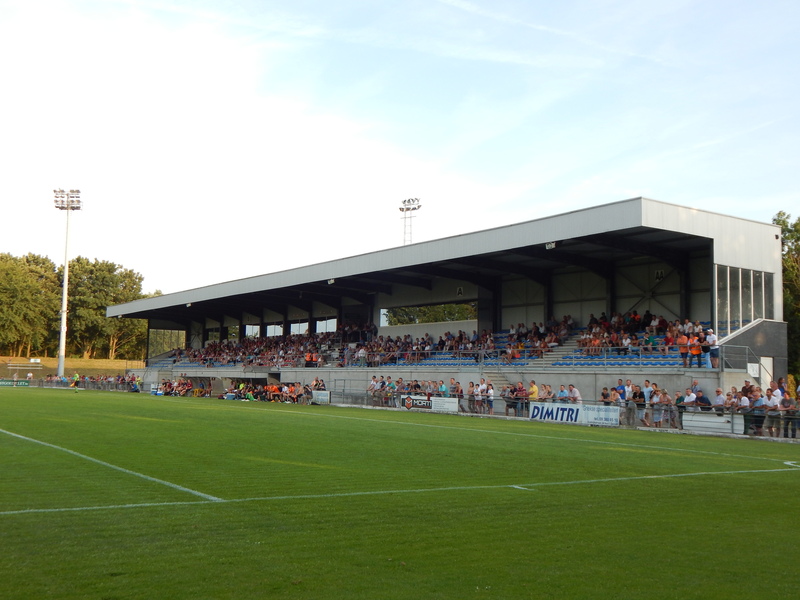 Initially the new club, Sportkring Deinze joined the Flemish Football Association but within eight days they had been affiliated to the Belgium F.A. and were allocated the matricule number 818. The new club opted for “non-political” colours of orange and black suggested by founding member Emil Torck whose property had links to Queen Wilhelmina of the Netherlands. Having decided on a kit the choice of a home ground was problematic. The clubs’ initial friendlies were played on a pasture in Petegem-Dries with the goalposts having to be carried up from St.Hendricks College! Eventually the club approached local landowner, who rejoiced in the name of Count Sixtius Pierre Marie Ruffo de Bonneval de la Fare des Comtes de Sinapoli Calabria, he was known locally as the Castle Lord of Astene. He owned an abandoned field near the railway line and was more than happy to grant the club free use of the field known as Aston Drove. The first game at the new ground was on June 6th 1926 and a 1-1 draw ensued against the visitors of SK Nevele. The new club though had a troubled infancy which mainly concerned their membership of the French speaking Belgian F.A. The Flemish speakers, led by founding member Albert Van de Sompel, broke away from Sportkring and formed their own club, FC Hooger Op Deinze, affiliating to the Flemish F.A. Aston Drove was requisitioned by the Germans during World War Two and when the club regrouped after the hostilities they found their ground had been turned into a junkyard. After clearing the site the club resumed playing matches in 1946 and a year later erected a grandstand at the ground for the first time. It remained the club’s home ground until the 1970’s when the descendants of the Earl gave notice of eviction to the club so they could sell the land. The Mayor of Deinze, Ernest Van de Wiele, stepped in and land was made available alongside Canal Schipdonk. The new ground was ready for the 1978/79 season and a year after taking up residence a new grandstand was built. This edifice had a relatively short live span when in 2005 it was replaced by the present structure which boasted meeting rooms and far superior facilities for the club. 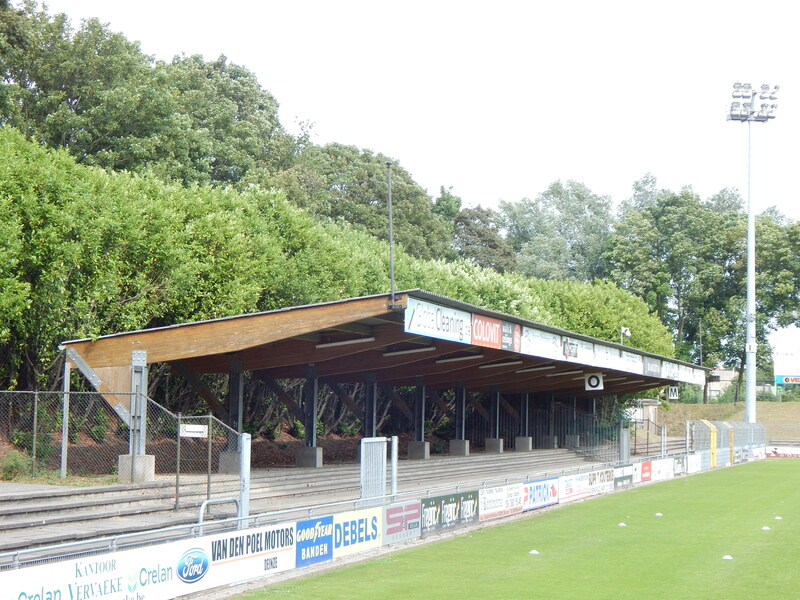 The eye-catching, tree line covered terrace was opened in 1992 when the club won promotion to the Third Division. The club had steadfastly remained in the “promotion” league at levels four to seven for all of their existence until the late 1980’s when success finally came their way. Two second place finishes in 1989/90 and 1990/91 were followed by a championship win in 1991/92. 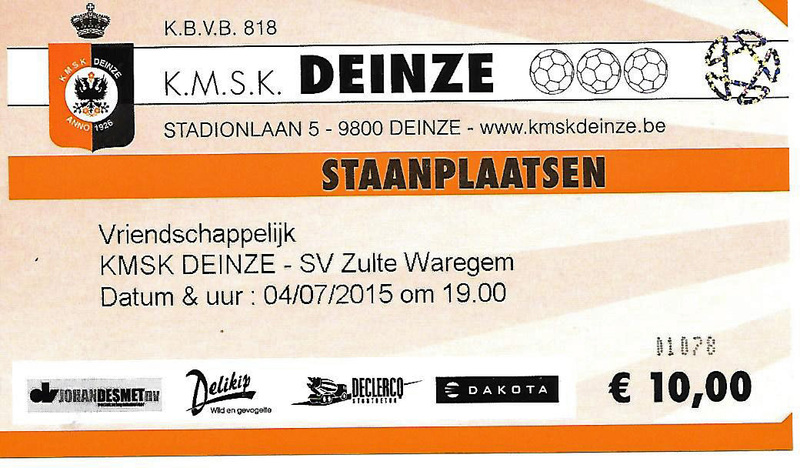 Not content with a first ever season at the third tier, Deinze won the league for a second straight promotion. The Orange and Blacks enjoyed a sixteen season stint in the Second Division with their best finish being a third place, and qualification for the final round play offs, in 1996/97. 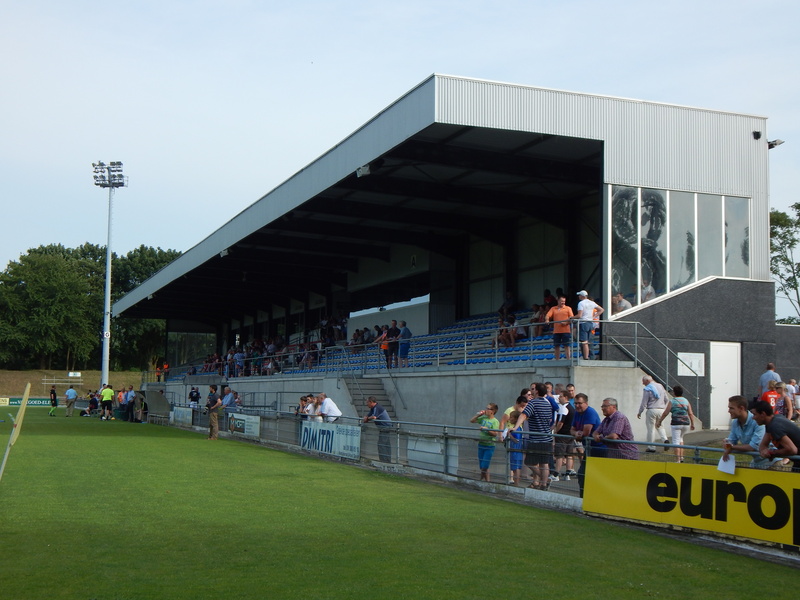 Deinze were relegated at the end of the 2008/09 season and it took six seasons before they once again gain elevation to the second tier. A second place finish in Division 3A was achieved under the guidance of Belgium international legend, Jan Ceulemans. 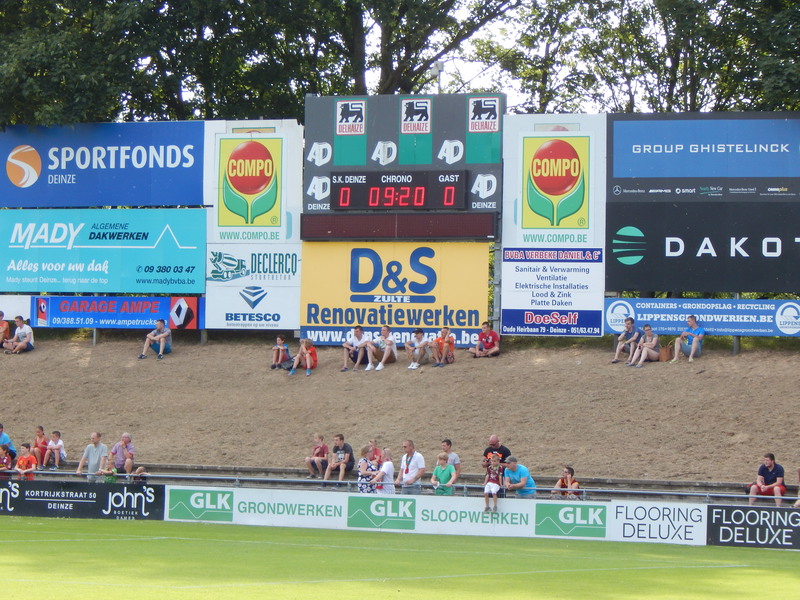 Despite finishing six points behind champions, KVV Coxyde, Deinze met the strict licensing rules for promotion, which sees Koninklijke Maatschappij Sportkring Deinze playing once again at the highest level in their history for the coming campaign. 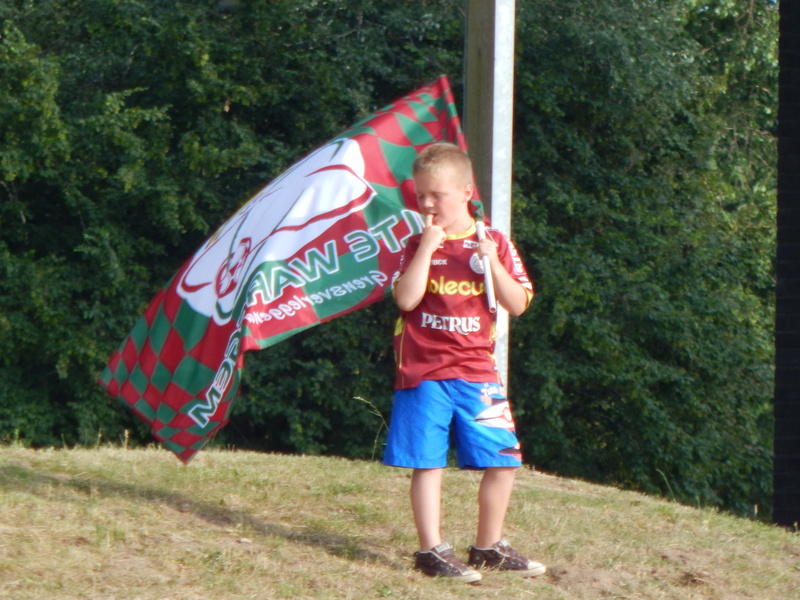 Tonight’s match see’s the local side take on the might of Jupiler Pro League stalwarts SV Zulte Waregem. It’s a warm night and the pace of the first half in particular was almost sedentary. The only goal of the first period came from the skilful and hugely impressive Stephen Buyl. It was the pacy winger that struck again early in the second half before setting up captain M’baye Leye for a tap in third. The scoreline was a little harsh on the hosts but they will certainly need to sharpen their own forward play for the challenges of Division Two. 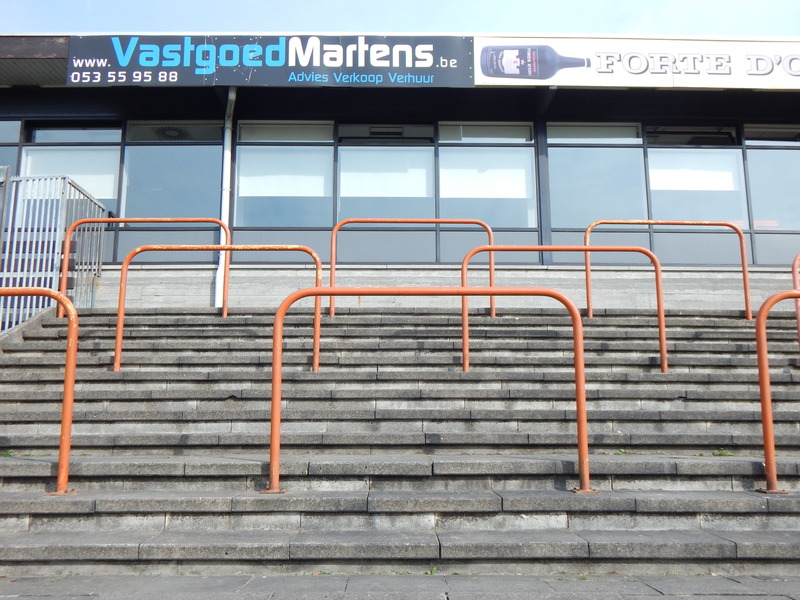 This entry was posted in Travel and tagged Belgium, Burgemeester Van De Wielestadion, Deinze, groundhopping, KMSK, Waregem, Zulte by peterrmiles. Bookmark the permalink.